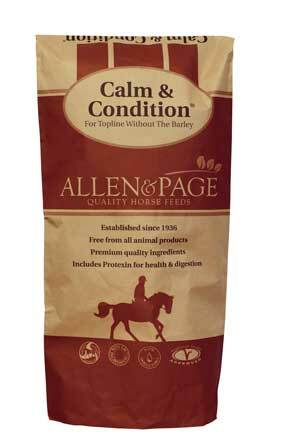 Calm & Condition is a pelleted feed for horses who need to put on condition, but remain calm. It is suitable for horses with a true barley intolerance. Low in starch and high in fibre, a high oil balance of linseed and soya oil helps to promote fantastic skin and coat condition. Calm & Condition is also used successfully for competition horses who are working hard but need to remain sensible. Boosted vitamin and mineral levels and premium grade herbs also combine to promote optimum condition. Used by Pippa and William Funnell.